When it comes to log home care, no one does it better than 888-LOG-GUYS! Our staff is top-notch in customer service and is prepared to give you the information you need to care for your log home. Our crews deliver our services in a professional manner and stand out when it comes to quality work. 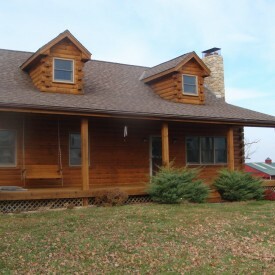 We restore log homes, repair log homes, improve log homes, and maintain log homes in the McPherson KS area. Give us a call, and let us show how we can help you as we have done with many, many clients already! We restore logs homes…back to what it was? Nope! 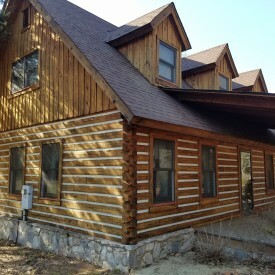 We restore log homes to its very best condition! We start by blasting off the faded, peeling stain (with corn cob, sand, glass, or walnut holes) off the logs. Then, we sand the logs (if you would like a smooth finish) and clean the logs with a borate treatment. Next, we can apply chinking or caulking before finally staining with the best stain product of your choice! We can make any log home look amazing! Give us a call, and you won’t be disappointed! 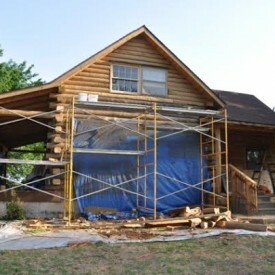 There is probably not much we haven’t seen when it comes to fixing log homes. Our crews have repaired thousands of feet of log due to log rot, water damage, and damage created by bugs, insects, and birds. We have even replaced whole walls because the damage was so extensive! From our experience, we are confident that we can repair your logs and your log home back to better than new! Over time, as your logs expand and contract, gaps may form in between your logs. That leaves room for water leaks, bugs and insects to crawl in, and air drafts to invade your home. 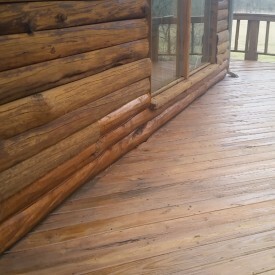 Our crews will professionally apply or repair chinking or caulking to your log home, and our work is guaranteed! 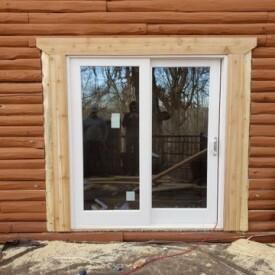 If you would like to close those gaps to protect your log home from nature’s elements, then give 888-LOG-GUYS a call or ask for an estimate from our website! If you have noticed, we do a lot of log home restoration and log home repair work! But, did you know we can also build additions to your log home and make it even more the log home of your dreams? 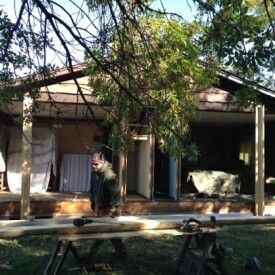 We can construct log staircases and log railings. We can even build decks, porches, and patios to add to the exterior of your log home. Call our number or send us an estimate request from our website, and ask us what else we can do to make your log home in the McPherson Kansas area even more beautiful. We are dedicated to maintaining your log home to keep it in superb condition! Once your log home is stable and secure, we don’t want you to deal with another log home restoration or rot repair because your log home was not properly taken care of! We will be in charge of the upkeep of your log home, keeping track of when your log home will need to be cleaned, re-stained, and re-sealed. Call us to inquire for more information on our log home maintenance plan!